Food Costs > How Much Does Croquembouche Cost? How Much Does Croquembouche Cost? Croquembouche, which means crunch in the mouth, is a traditional French dessert of small cream puffs coated and set in place in a conical or pyramid shape by caramelized sugar. This dessert is often decorated with sweetened almonds and is placed as a centerpiece on the table during French weddings, child christenings, first communions and other special occasions. Popularly called pièces montées, or mounted pieces, the croquembouche is said to have been developed by French pastry chef Antoine Careme in the 18th century. How much does a croquembouche cost? Depending on the number of “profiteroles” you want, the costs of croquembouche can be anywhere from $2 to $4 per profiterole. Most bakeries will require a minimum order of at least 20. The costs will really come down to the bakery you’re using, the design of your tower and the number of profiteroles you need. At Croquembouche.com, for example, each profiterole in a croquembouche tower costs $2.50. At Adrianozumbo.com, the prices of croquembouche are as follows: 35 profiterole tower for $ 105 or a 100 profiterole tower for $300. One member on CakeCentral.com, saying it could cost close to $2.50 per person without any decorations. The smallest croquembouche is usually made of 30 profiteroles, and as mentioned, many bakeries will have a minimum before they accept your order. Ordering a croquembouche of any size will require at least one week notice, but it is best to give two to three weeks. If you are ordering one to go on each table at a wedding or other event, it would be wise to give up to two months notice. If you wish to add more decorations to your croquembouches, such as flowers, angel hair, butterfly, sugar figures, bride and groom figurines, or any other type of topper, then you have to pay extra for it. These can either be purchased through the bakery or can be purchased separately. A delivery fee, if needed, is an extra cost to consider if you need the bakery to deliver to your location. Depending on the distance traveled, this often $20 to $40. Some people prefer their croquembouche sits on a cake. A cake, if you go this route, can be an extra cost to think about. One of the most popular decorations on a croquembouche is the spun sugar, which is a gentle cobweb of caramel draped around the outer portion of the pyramid. Traditionally, the croquembouche used to be cracked open with a heavy knife or sword, while guests picked away the profiteroles, but this practice has been changed. Today, guests just pull the croquembouche apart with their fingers. Croquembouche must be prepared within three hours before serving, but you can prepare the profiteroles ahead and have them filled a day before serving. Traditionally, the French used to bring their own sweet bread when attending a wedding reception and would pile them up together to form a tower. The newlyweds were then asked to kiss over the top of this tower to presage their prosperity and fertility. However, this practice was eventually changed when pastry chef Antoine Careme invented the croquembouche. Since then, croquembouche became the centerpiece at wedding receptions. Pick up your croquembouche order instead of having it delivered to you to save on delivery charges. Minimize decorations on it to spare you from extra expenditures. After all, the profiteroles look stunning enough without all the extras. Check with at least three bakeries in the area to see how their pricing differs. Don’t just focus on the price, though. Be sure to check out their reviews and reputation as well. 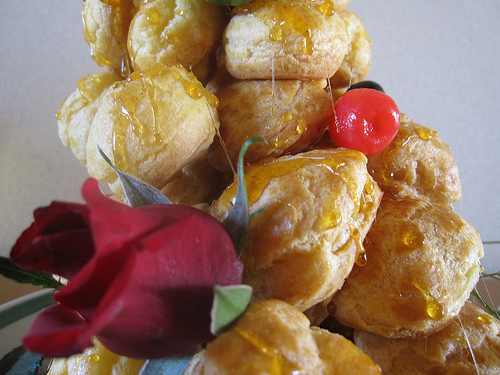 If you are the adventurous type and love to bake, you can make your own croquembouche at home. Initially, you will have to purchase the mold, recipe book, and other implements. But, it would may all be worth it later on.